There were times when the Corinthians drove St. Paul crazy – and the words we’ve heard this morning were written in one of those times. The Corinthians were so proud of their spiritual gifts. Some could speak in tongues, and others could interpret those tongues; some even had the gift of prophesy. The people who could speak in tongues were very full of themselves, and those who couldn’t speak in tongues were envious. The people who could prophesy looked down on those who couldn’t prophesy. The people with gifts of healing wished they had the gift of tongues. And don’t get me started on their pot-luck suppers! They gathered regularly for the Eucharist, followed by supper. They all brought dishes to the table, but the rich brought a lot of food and ate most of it themselves – while the poor ate from their own meager rations and from the rich people’s leftovers. They were all baptized in water, and all baptized in the Spirit, and they all wanted to follow Jesus – but they still had so much to learn! When Rob and I were first married and starting graduate school, we found an Episcopal church that we liked for its music and its preaching. We didn’t know anyone in the congregation, but we decided to make it our church home anyway. After about a year a new group of ‘young marrieds’ was formed by the junior priest – he was new, too. In our meetings and our own little pot-luck suppers, we talked about the importance of building community, and our priest encouraged us to reach out to other parishioners, starting with coffee hour on Sundays. I was very shy then and couldn’t bring myself to do this, , but Rob got the message about community life, and the very next Sunday he decided to introduce himself to someone new. Someone really didn’t get Paul’s message. 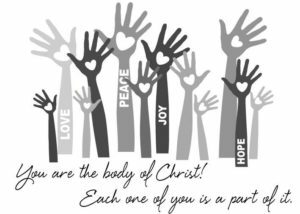 In the reading we’ve heard this morning – from chapter 12 – St. Paul tells the Corinthians that every member of their church has spiritual gifts. He also tells them that their church is like a human body: they are all connected, and every one of them is necessary for the whole body to function. In the chapter before this (chapter 11), Paul had reminded them that sharing and mutual caring are the very foundation of the Eucharist. And in the chapter after this (chapter 13), Paul returns to his theme of love and caring, because love is the life blood that holds a church together. But we usually hear chapter 13 – one of the most beautiful passages in the Bible – in the context of a wedding (or perhaps at a funeral where we honor someone who was especially loving and giving). Now there are varieties of gifts, but the same Spirit. There are varieties of service, but the same Lord. There are many forms of work, but all of them, in every person, are the work of the same God. To each is given the manifestation of the Spirit for the common good. One person, through the Spirit, has the gift of wise speech, while another, by the power of the same Spirit, can put the deepest knowledge into words. Another, by the same Spirit, is granted faith; another, by the one Spirit, gifts of healing, and another miraculous powers; another has the gift of prophecy, and another ability to distinguish true spirits from false; yet another has the gift of ecstatic utterance of different kinds, and another the ability to interpret them. But all these gifts are the work of one and the same Spirit, who distributes them separately to each individual at will. 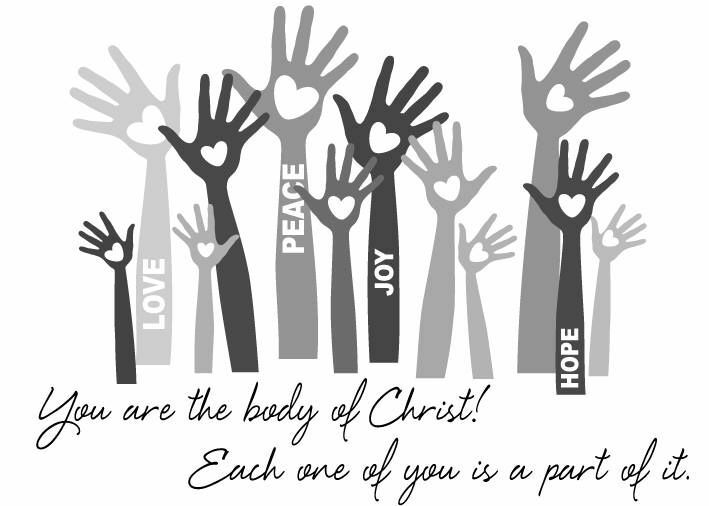 For Christ is like a single body with its many limbs and organs, which, many as they are, together make up one body. For indeed we were all brought into one body by baptism, in the one Spirit, whether Jew or Greek, whether slave or free; and that one Holy Spirit was poured out for all of us to drink. A body is not a single organ, but many. Suppose the foot should say, “Because I am not a hand, I do not belong to the body” – it still belongs to the body. Suppose the ear were to say, “Because I am not an eye, I do not belong to the body” – it is still part of the body. If the body were all eye, how could it hear? If the body were all ear, how could it smell? But, in fact, God appointed each limb and organ to its own place in the body, as God wanted. The eye can never say to the hand, “I do not need you”; nor the head to the feet, “I do not need you”. Quite the contrary: those organs of the body which seem more frail than others are indispensable, and those parts of the body which we think less honorable we clothe with greater honor, while our more respectable members do not need additional respect. God has combined the various parts of the body, giving special honor to the humbler parts, so that there might be no division in the body, but that every organ might feel the same concern for all the other organs. If one organ suffers, they all suffer together. If one flourishes, they all rejoice together. Now you are Christ’s body, and each of you a limb or organ of it. Within our community God has appointed in the first place apostles, in the second place prophets, thirdly teachers; then miracle-workers, then those who have gifts of healing, or ability to help others or power to guide them, or the gift of ecstatic utterance of various kinds. Are all apostles? all prophets? all teachers? Do all work miracles? Have all gifts of healing? Do all speak in tongues of ecstasy? Can all interpret them? The higher gifts are those you should aim at. And now I will show you the best way of all. I may speak in tongues of mortals or of angels, but if I am without love, I am a noisy gong or a clanging cymbal. I may have the gift of prophecy, and know every hidden truth; I may have faith strong enough to move mountains; but if I have no love, I am nothing. I may give away all I possess, or even give my body to be burned, but if I have no love, I am none the better. Love is patient; love is kind; love envies no one. Love is never boastful, nor conceited, nor rude; love is never selfish, never quick to take offense. Love keeps no score of wrongs; love does not gloat over others’ sins, but delights in the truth. There is nothing love cannot face; there is no limit to its faith, its hope, and its endurance. Love will never come to an end. Are there prophets? their work will be over. Are there tongues of ecstasy? They will cease. Is there knowledge? it will vanish away. For our knowledge and our prophecy alike are partial, and the partial vanishes when wholeness comes. (When I was a child, my speech, my outlook and my thoughts were all childish. When I grew up, I was finished with childish things.) Now we see only puzzling reflections in a mirror, but then we shall see face to face. Our knowledge now is partial; then it will be whole, like God’s knowledge of us. There are only three things that last for ever: faith, hope, and love – and the greatest of them all is love. This morning, on the day of our Annual Meeting, can we hear what the Spirit is saying to the Church? Preached at St. Patrick’s Episcopal Church, Kenwood on January 20, 2019. I hope Rob called him “Your” or “Mr. Vestryman” for the rest of the time you were there! Rob is so good-humored he’s always just seen this as a funny story about life in the church (any church). PS After I gave this sermon, I sat at a coffee-hour table with a former vestryman (from the stories he was telling), who never spoke to me. I either hurt his feelings or he was living the sermon example!